Vast reservoirs of frozen water have been detected by the Herschel Space Observatory in a planet-forming disc around a young star, while the Spitzer Space Telescope has found evidence for cometary bodies raining in on a nearby solar system. Ten million year young TW Hydrae is located 175 light years away in the constellation Hydra, represented in Greek mythology as a water snake. It seems apt then that astronomers using the Herschel's Heterodyne Instrument for the Far Infrared (HIFI) have detected the equivalent of thousands of Earth oceans worth of water, in the form of water vapour, in the outer regions of the star's protoplanetary disc. 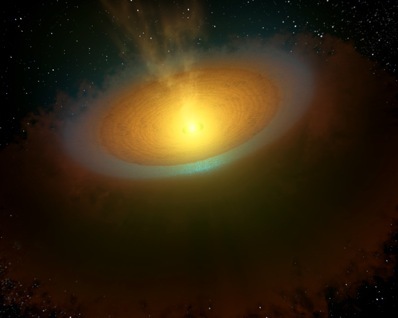 Artist's impression of an icy protoplanetary disc wrapped around young star TW Hydrae. Image: ESA/NASA/JPL-Caltech. Ultraviolet light streaming from the central star and other nearby stars and pelting ice in the disc is thought to be responsible for producing the vapour clouds. 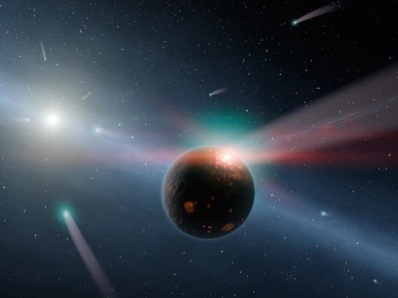 "The water vapour we expect to be destroyed or blown out of the system quite fast, but the ice can survive for millions and even billions of years," team leader Michiel Hogerheijde tells Astronomy Now. The finding draws exciting parallels to the formation of our own Solar System, which too hosted a vast reservoir of water ice that was subsequently delivered by comets to the inner Solar System during the so-called Late Heavy Bombardment era some 600 million years after the Earth's formation. Comets are thought to be responsible for flooding Earth with its oceans, a theory bolstered by the recent observation that the chemical signature of water ice in comet Hartley 2 is similar to that of our planet's oceans. "We expect that such heavy bombardments are a phase that each forming planetary system goes through, and it is probably during this time that the comets that might form in this system could deliver oceans to any terrestrial planets that have formed," adds Hogerheijde. Indeed, in a separate report also announced this week, scientists using the Spitzer Space Telescope have found evidence for such a bombardment era in the one billion year old Eta Corvi system, 60 light years away. Circling the bright star is a dust disc laced with the chemical fingerprints of water ice, organics and rock, interpreted as the product of a collision between a giant comet and a rocky planet, or with another comet. A second more massive ring located further out contains much colder dust, and is the likely source of the comets. This pairs well with the Kuiper Belt that wraps around the outer reaches of our own Solar System, where left-over rock-ice building blocks from the planet formation epoch linger. The Herschel Space Observatory research is reported in today's issue of the journal Science; the Spitzer findings have been accepted for publication in the Astrophysical Journal.